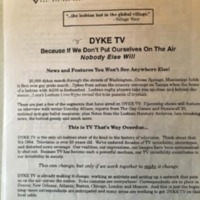 A flyer announcing the third season of Dyke TV and encouraging people to come to a producer's meeting to present ideas. 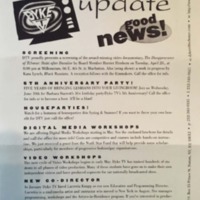 A fundraising letter describing some of the past news and features presented by Dyke TV, and asking for donations to continue creating programming. The letter warns that without help, Dyke TV will soon be off the air. 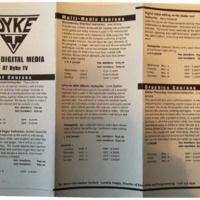 A flyer advertising jobs at Dyke TV. Positions include camera operator, video editor, news writer/producer, fund-raiser, and public relations. Contains casual descriptions of positions and required skills. A flyer advertising jobs at Dyke TV. Positions include camera operator, video editor, news writer/producer, fund-raiser, and public relations. A flyer advertising two internet courses. One teaches about the internet being used for lesbian and women's organizations and communication. The second teaches how to design a web page. 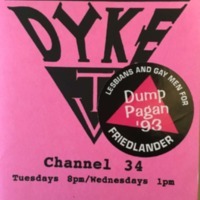 A promotional flyer for Dyke TV. 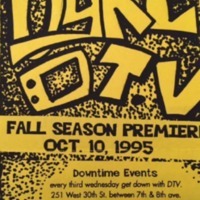 A flyer advertising the 1995 fall season premier of Dyke TV, as well as related promotional events and requests for "Lesbian Child" segment participants.